Azure IoT Hub notifications give detailed insight into operations happening in your IoT solution such as devices being registered, deregistered or reporting data. Combined with Device Twins, they offer a very powerful tool to control and monitor your IoT solution. Here is how you can replicate devices Twins properties to an external store leveraging Azure IoT Hub notifications. A key feature of Azure IoT Hub is the ability to execute SQL-based queries on data published from devices. Such data is persisted to an IoT Hub managed store allowing IoT solutions to simply query device data without having to provision their own store, define a data model, keep the store synchronized and handle the other challenges of building and maintaining a custom store. That said, some IoT solutions require device data to be kept in an external store. Reasons may include the need to query device data in a manner not supported by the IoT Hub data store (i.e. graph queries, text search, etc. ), the need to join the device data with a broader dataset or the need to control where the data is replicated. Device Twins are used to synchronize state between an IoT solution’s cloud service and its devices. 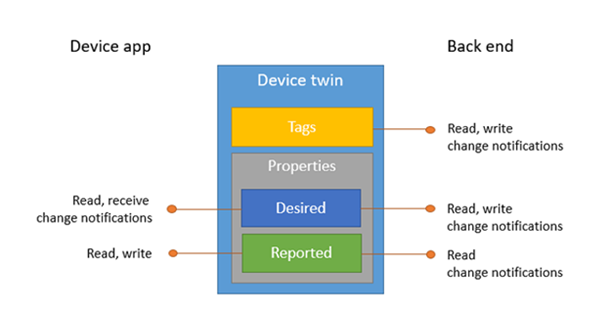 Each device’s twin exposes a set of desired properties and reported properties. The cloud service populates the desired properties with values it wishes to send to the device. When a device connects it requests and/or subscribes for its desired properties and acts on them. Likewise, a device populates properties with values it wishes to send to the cloud service via its twin’s reported properties. The cloud service can retrieve any of a device’s reported or desired properties via point lookups or, as mentioned in the overview, a query across a set of devices based on its properties. Alternatively a cloud service can be notified of device lifecycle events and twin property change events allowing the service to react as new devices are added, existing devices are removed or as twin properties change. The code snippet above gets the previously registered device from the IoT Hub to obtain the device’s symmetric key used to generate authentication tokens. Typically the device will not have permissions to get its symmetric key in this manner but is done so for the sake of the sample. The sample then creates an instance of DeviceAuthenticationWithRegistrySymmetricKey object, which represents the authentication method used when communicating with the hub, passing the device’s symmetric key and ID. The IotHubConnectionStringBuilder helper class is then used to generate the device’s connection string using the DeviceAuthenticationWithRegistrySymmetricKey object and the URI to the IoT Hub where the device is registered. DeviceClient.CreateFromConnectionString is then used to create a DeviceClient with the newly formed connection string. OpenAsync opens a link to the hub. The TwinCollection class specifies a set of properties to report. DeviceClient.UpdateReportedPropertiesAsync sends the set of properties to the IoT Hub where they are persisted in the hub's default store. The cloud service can then retrieve the properties for a specific device by its device ID or via queries as discussed earlier. Device Twin Notifications are implemented using another IoT Hub feature called routes. Routes allow device messages and notifications from various IoT Hub sources to be forwarded to user specified endpoints based on a filter. For instance whenever a device is added or removed from an IoT Hub a routable notification is raised. Whenever a twin property is updated a routable notification is raised. In this sample, both of these notification types are routed to an preconfigured Azure Event Hub endpoint. SyncGraphDbApp listens on an Event Hub for these notifications and synchronizes the graph store. Routes can be configured via the Azure Portal or via ARM templates. To experience the end-to-end sample, you can follow the step-by-step instructions on GitHub. 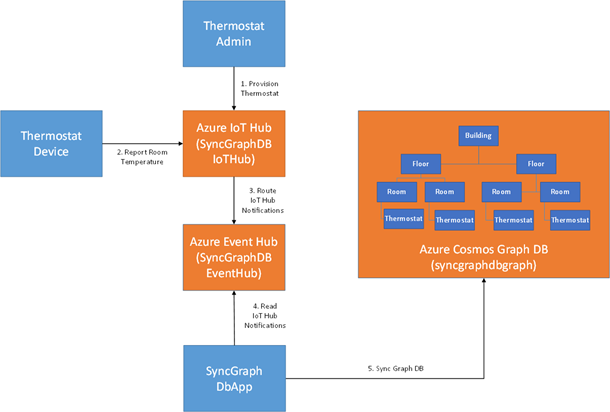 In the sample, the SyncGraphDbApp application simulates a cloud service that leverages Azure IoT Hub notifications to replicate thermostat data to a Cosmos DB graph. SyncGraphDbApp uses device lifecycle notifications to create Thermostat vertices in the Cosmos DB Graph for each newly provisioned thermostat whenever a new Thermostat is registered via ThermostatAdmin. As ThermostatDevice publishes the thermostat's current temperature SyncGraphDbApp updates the Temperature field of the Thermostat vertex. SyncGraphDbApp internally implements SyncCommand subclasses to process each message source and operation type combination. To start CreateDeviceIdentitySyncCommand adds a new vertex to the graph that represents a new thermostat and associates the thermostat with a Room vertex based on its location via a new edge. The sample only allows one thermostat to be associated with a room at a time. Also note that notifications can have duplicates. As a result conflict errors must be handled. SyncGraphDbApp is a single instance console application that demonstrates how to consume IoT Hub notifications and update an external store. In order to make the solution scale it needs to be hosted in an Azure Worker Role which scales to multiple instances and listens on a partitioned Event Hub. IoT Hub notifications use the notification's device ID as the Event Hub partition key. As a result, device lifecycle and twin change notifications are routed to a partition based on the notification's device ID. For more information please see documentation. When processing twinChangeEvents notifications, both replaceTwin and updateTwin opTypes must be processed to ensure the latest changes are synced. Create IoT Hub's routes as explained previously. Once you have gone through the sample, let us know if you have feedback or suggestions, and do not hesitate to send us contributions directly on GitHub as well.